An electoral worker counts ballots at a polling station in Guatemala City, Sunday, Sept. 6, 2015. Guatemalans voted in general elections Sunday in the wake of a corruption scandal that triggered the resignation of President Otto Perez Molina late last week. Sunday's presidential, Congressional, and municipal elections are for a four-year term to begin in 2016. Until then, former Vice President Alejandro Maldonado will lead Guatemala. U.S. Vice President Joe Biden called Maldonado to congratulate the government for holding the elections. The two men reaffirmed their shared commitment of working together to bring about "concrete results in countering transnational criminal elements, stemming the he flow of illegal migration, and promoting security and economic opportunity in Central America," the White House said in a statement. Guatemala's former President Otto Perez Molina talks to reporters after his second hearing in Guatemala City, Sept. 4, 2015. 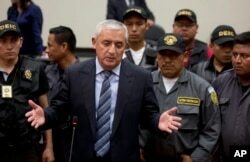 Hundreds of protesters called for the election to be delayed, as they gathered at the Supreme Court building in Guatemala City where Perez Molina appeared in court Thursday and Friday. Perez Molina said in court he is innocent of accusations that he accepted $800,000 in an alleged bribery ring nicknamed "The Line." The nickname references the special telephone line said to have been reserved for businessmen who allegedly paid bribes to officials to avoid import taxes. The former president said in court Friday that he accepted no bribes and bragged that he had been offered -- and refused -- 10 times that amount from fugitive drug trafficker Joaquin "El Chapo" Guzman when the Mexican drug kingpin was captured in 1993. The ousted president's mention of Guzman also served as a reminder that Perez Molina had been behind the long-sought fugitive's arrest. Guzman has since escaped from prison in Mexico by bribing prison officials. Perez Molina has not yet been formally charged. He next appears in court on Tuesday. Thousands of Guatemalans filled the streets last week when news of the president's resignation spread. They had been protesting for months, demanding that he step down. Perez Molina was elected in 2011 on an anti-corruption pledge. Guatemala continues to be one of Latin America's most impoverished countries. White House spokesman Josh Earnest said Washington supports Perez Molina's decision to resign. "We commend the people of Guatemala and their institutions for the manner in which they have dealt with this crisis, and continue to underscore our support for Guatemala's democratic and constitutional institutions," Earnest said.